1 tablespoon of mushroom dark soy or normal dark soy. Crush garlic, spring onion and ginger to a rough paste using a pestle and mortar. Add this to a mixture of salt, five species, sugar and dark soy. Cut the chicken open along the centre backbone using a meat scissors/shear. press the chicken breast flat from the skin side. bone, then leave the flavor and color (soy) to penetrate for 3 - 4 hours. Scrap off bits of marinade on the chicken. the red hot roasting tin and spit all over the place, making such a mess to the oven. Also the juice collected using this water method will not burn or char. The juice collected on the roasting tin can be reduced to serve as a sauce. Do skim off the fat. roasting it the traditional English method. This marinated chicken is suitable for barbecue too. 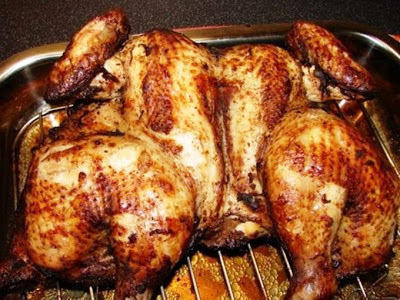 I always serve this roast chicken with a ginger chili sauce from this recipe. fridge for few days, the longer you keep it the milder it gets but still nice.